"Celeste & Jesse Forever" isn't terribly good, but this awkward romance at least gets points for presenting an unusual premise. Silly and sickeningly sympatico soulmates Celeste (Rashida Jones) and Jesse (Andy Samberg) seem to be the perfect couple when we first see them onscreen. Sharing private jokes, slipping into funny voices and generally cracking each other up, they have been best friends since childhood and married for seven years. That's why even their closest pals can't understand why the two are getting divorced. Unfortunately, audiences are likely to wonder the same thing. The cause of contention could be the fact that Celeste's job—some new-economy combination of author, PR exec and "trend forecaster"—is going better than Jesse's freelance art career. ("The father of my children will have a car," Celeste announces.) Or maybe Celeste has come to resent Jesse's slacker attitude in general, although his lack of ambition seems to be a lifelong character trait she must have known about before they got hitched. But because the two good-natured goofs plainly still adore each other—Jesse even lives in a studio behind Celeste's house—it's hard to imagine some unseen occasion when they mutually decided that splitting up would be a good idea. Watching still-amicable soon-to-be-exes adjust to life on their own could have been interesting. The movie goes wrong by turning Celeste into a slapstick stereotype: the intelligent and savvy female who becomes a blithering co-dependent idiot after a breakup. That's what happens when Jesse moves away after abruptly giving up hope that the two will save their marriage. Celeste rapidly transforms from unflappably cool professional to flakey alcoholic pothead. 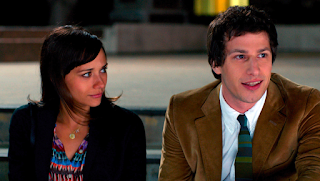 Jones often seems to be impersonating ditzy characters played by Samberg's former "Saturday Night Live" costar Kristen Wiig, with a little Zooey Deschanel "adorkableness" on the side. An implausible plot complication involves Jesse reuniting with a poised and ridiculously attractive former flame (Rebecca Dayan), whom he impregnated during what we are told was a brief timeout in his marriage to Celeste. That angle is good for a little poignancy, as a regretful Celeste realizes Jesse truly has moved on and is going to be a father. But man-child Jesse's near instantaneous transition to solemn maturity is as hard to buy as his ability to hook up with such a world-class hottie in the first place. Elijah Wood appears in a small role as Celeste's gay boss, who thankfully is not portrayed as the typical flamingly flamboyant cartoon. Will McCormack, who cowrote the screenplay with Jones, plays a weed dealer named Skillz who is opposed to legalizing marijuana. Emma Roberts is excellent as a bitchy and self-centered pop star, but the screenplay makes a huge mistake by turning her into Celeste's hug-needing confidante when she experiences boyfriend troubles of her own. On the positive side, segments about the frustrations of building an IKEA dresser, an awkward pickup at a yoga class and a logo design gone embarrassingly wrong are amusing. And Celeste has some endearingly pathetic self-putdowns ("I should break up with me"). Even though the project as a whole has more problems than pleasures, it would be nice if more movies came up short this way—by at least trying to be something different, instead of going through the usual romantic-comedy motions.